Assalam-0-Alaikum and Welcome to Tech Urdu! Ever wondered about your 13 digit CNIC (Computerized National Identity Card Number) Is it randomly generated of a systematic one? 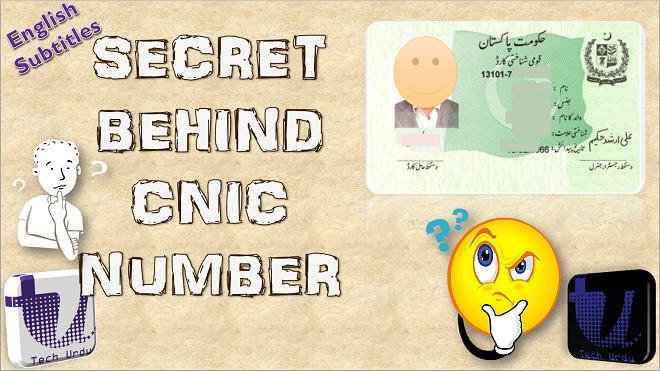 In Today’s video, we’ll be talking about CNIC Number and the Secret Behind it. Scroll Down for detailed video. You'll get answer of your every question. As you know that your CNIC is issued by NADRA (National Database and Registration Authority). First of all, the CNIC Number is not just a random number rather a very systematic number based on the area you reside. This 13 Number digit comprises of three main parts first part has 5 numbers then ( – ) then 7 number again a ( – ) and then 1 number. The 1st number shows province: 1=KPK, 2=FATA 3=Punjab 4=Sindh 5=Balochistan 6=Islamabad, and 7 = Gilgit Baltistan. Well, I ‘ll be taking my own example. First 5 digits of my CNIC are 51602 so I am from Balochistan. 2nd No Shows the Division of that particular Province. My example 51602 so 1=Kalat Division (out of 6 divisions of Balochistan. 3rd Number shows District of that particular Division. 4th Number shows Tehsil of that particular district. If 4th Number or Tehsil Number is 0 (zero) then it means that both District and Tehsil have the same name. In my case 51602, both District and Tehsil have same name ie Mastung. 5th Number shows Union Council (UC) Number. The next seven number after (-) shows the Family Number. This information is saved in NADRA Database. From the first 5 number of CNIC, you can track a person up to his/her Tehsil Level. But you can’t track his Family Number. The last single number after the (-) is, if, even then this CNIC is of a female and if odd then of a male. Please Like, Share and if you want more such interesting and informative videos then Subscribe to Tech Urdu. which algorithm is used on the backhand of our CNIC??? ?